Welcome to Sunrise Lettings, a quality self catering apartment in the heart of the beautiful coastal village of Charmouth. This charming and well-appointed apartment overlooks a delightful county garden full of local character, with its beehives, pond and summerhouse. Situated in a valley at the heart of Lyme Bay, Charmouth is the perfect location for exploring the beautiful Dorset countryside. We regard our visitors as friends and hope we make any visit with us like a home away from home. 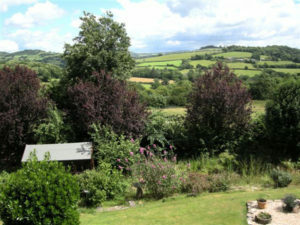 We love where we live, the unspoilt countryside and stunning views truly are something to behold. Charmouth has a wide range of places to eat. From Pubs and restaurants, tea rooms and cafes, to takeaways. To help you choose please see our Where to eat and drink listing. Charmouth has it all! Whether it is daily essentials, fresh produce to cook yourself, hardware, household goods, gifts, arts and crafts, or want to pamper yourself at the hairdressers. See our Shops page for a full listing of the shops in Charmouth.